Before bringing home any new pet, it’s important to understand what they eat. Frogs can be beautiful and interesting additions to your home, but only if you can feed them properly. So, what do frogs eat? Frogs are predators that can’t just eat pre-packaged kibble the ways dogs do. That makes things trickier. In the wild, frogs eat a wide variety of insects. Frogs are predators that will generally only eat things that are moving—which means feeding your frog live insects! Frogs are truly generalist predators—they’ll eat just about anything that comes their way in the wild. They’ll eat spiders, grasshoppers, butterflies, and just about anything else that fits in their mouth. Aquatic frogs eat a variety of aquatic invertebrates. Each species of frog has specific nutritional guidelines, but in general your pet frog will eat a mix of the following. Crickets will form the backbone of your pet frog’s diet. That’s not because they’re the healthiest—it’s just because they’re easiest to purchase or raise at home. Mealworms and waxworms are another tasty snack for frogs. Like crickets, mealworms are pretty easy to find at pet stores or raise at home. You can also purchase them at bait stores for fishing, but those won’t be gut-loaded. Locusts and grasshoppers can be a bit trickier to find in pet stores or purchase for your frog, but they add much-needed nutritional variety to your pet’s diet. Caterpillars or worms are getting easier to find in pet stores for purchase. 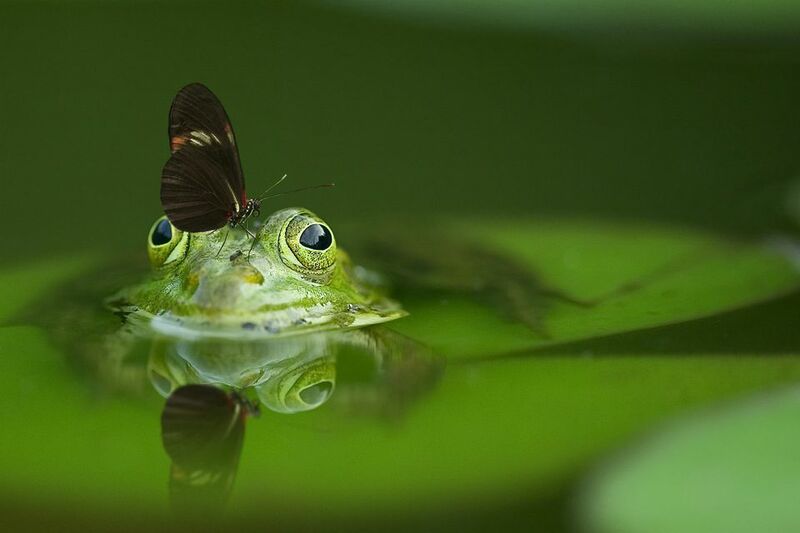 Be sure to purchase caterpillars that are the correct size for your frog, as they can be quite large! Bloodworms, brine shrimp, blackworms, and other small worms will be the main diet for aquatic frogs. Mice are part of the diet for large species of frog like Pacman Frogs and African Bullfrogs. As your frog grows, start feeding “pinkies,” or newborn mice. You can purchase these frozen or live—but keep in mind that most frogs won’t eat the frozen ones. Bigger frogs will eat “fuzzies” or even adult mice. If this grosses you out, pick a smaller frog species. Be sure to feed your frog food that’s less wide than the frog’s head, or your frog’s intestines can get impacted. Try to purchase gut-loaded insects whenever possible, as these are far more nutritious for your frog! If you can’t purchase gut-loaded food, your frog is at risk of Vitamin A deficiency. Some people prefer to “dust” their frog’s food with a nutritional supplement before feeding their frogs, especially if they raise their frog’s food at home. Avoid feeding your frog any fruits or veggies, human table scraps, or wild-caught insects. The wild insects pose a serious risk of pesticide exposure, which can be very dangerous for your frog. The exact feeding schedule and amount for your frog depends on your frog’s species, age, and activity level. Just like humans, frogs can become obese if overfed. It’s important to feed your frog the right amount to keep your pet healthy and fit. High-energy frogs (like dwarf frogs) and young froglets (under about 16 weeks) should have frequent access to food. Feed young frogs and high-energy frogs every day, or even twice a day. This might mean leaving a bit of food, like fruits or veggies, in the tank for the insects to eat. Medium-energy frogs should be fed every other day to every third day. In general, they should be fed about five crickets per meal. Ensure that you feed enough that your frog doesn’t finish eating within seconds, but don’t feed so much that you’re seeing crickets the next morning! Larger frogs should be fed less often. The large mouse-eating frogs might eat as infrequently as once per week or once every other week. Your pet frog should have constant access to clean, dechlorinated water. You can purchase a dechlorinator at most aquarium stores. Either provide a pool of water in the tank or mist the tank regularly—or both. Frogs don’t drink with their mouths, so it’s important to keep the humidity up. They “drink” by absorbing water through their skin! Frogs eat a wide variety of things in the wild. Feeding your pet frog should include a mix of different gut-loaded insects to ensure proper nutrition. Make a plan for how you’ll store these live insects before bringing your new frog home!